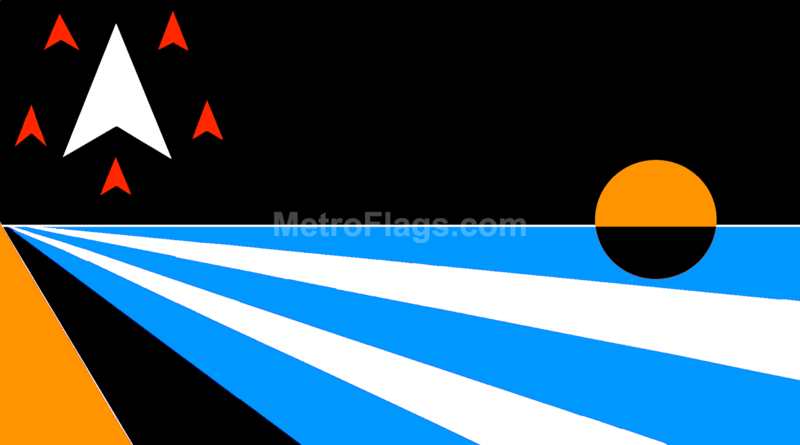 The Flag of Saturn, designed by J. Alfary, represents the planet Saturn itself and various moons. Orange represents Saturn's ammonia-rich atmosphere and its various storm bands that rage across its atmosphere. The white arrow triangle represents Saturn, while the five red small arrows orbiting Saturn represent the five Ring Shepard Moons of Pan, Daphnis, Atlas, Prometheus, and Pandora. The five white and blue bands represent the five main rings of Saturn (Rings A, B, C, D, and F), and the five largest moons: Titan, Rhea, Iapetus, Dione, and Tethys. The orange-black circle beyond Saturn represents the Moon Titan. Black represents the vastness of space that separates and unifies the Solar System and the Universe.